The trip has begun with the day trip to the Phoenix area. First stop was the Mesa Historical Museum to see the Play Ball exhibit about the history of the Cactus League. Mik took his PSP in, which I allowed as long as he behaved. He soon put that down, though, because I pointed out that they had a Wii to play. 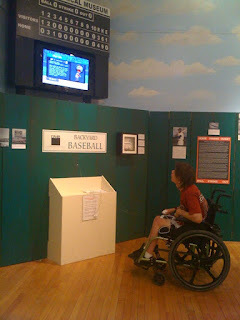 He sat and played Backyard Baseball on the Wii while Dad and I looked at the exhibit and a few other exhibits at the museum. The Wii was definitely Mik's favorite part. 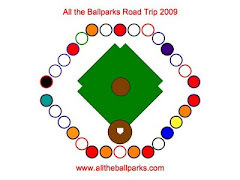 My favorite part was looking through knptholes in a fence at photos of Cactus League ballparks. Dad's favorite part was learning about Bill Veeck, Jr. and how Hi Corbett is where the Cactus League started. After lunch at Sonic we are now on our way to the BOB (i.e. Chase Field) for the Nationals at Diamondbacks game. I will post more photos of the exhibit and all the rest of the days photos probably tomorrow. Perhaps an update or two from the ballpark today, too.